I’m sure you’ve heard of microwave cakes before – but have you made a vegan one yet? Believe me – there is no milk or dairy needed to create these quick microwave wonders. And they’re perfect to satisfy any sweet craving within only a few minutes preparation time. 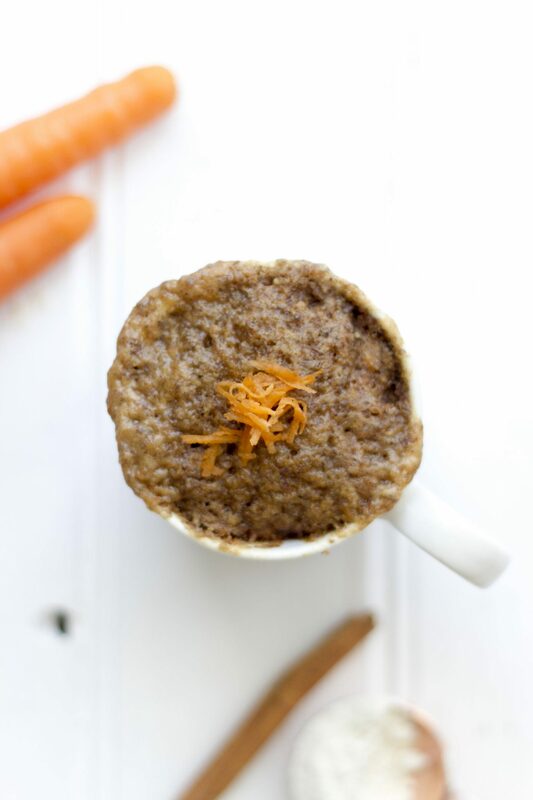 If you have read my previous blog posts and have spotted my carrot cake recipe you might have realised that I am slightly obsessed with carrot cake… but just a little 😉 So of course I had to find a quick mug cake version of this one as well! Find the recipe below, and most important of all: Enjoy! Add the milled linseeds to a small container with a little water and set aside for 5 minutes. In a mug combine the flour, sugar and baking powder with the cinnamon and ginger powder. Add the linseed mix and the carrots to the melted butter, then mix these wet ingredients into the mug with the dry ingredients.